KAE DIH ENTERPRISE CO., LTD.
1) Both models can be made in dry type or wet & dry type depends on demands. 2) Offer double filtering systems. Enclose high capacity collection bag, clean-up easily. Attached Filtering paper to filter dust. 3) Two start-up controls: manual or automatics. 4) Vacuum cleaner’s suction can be adjust. 5) For pneumatic tools & electric tools , offer convenient while working. 6) Enclose 5 meter 2-in-1 dust collecting hoses. 7) There are two options of filter cleaning system: MANU or AUTO. • Manual Filter Cleaning System: Triggering filter cleaning system manually to improve efficiency of dust extractor performance. 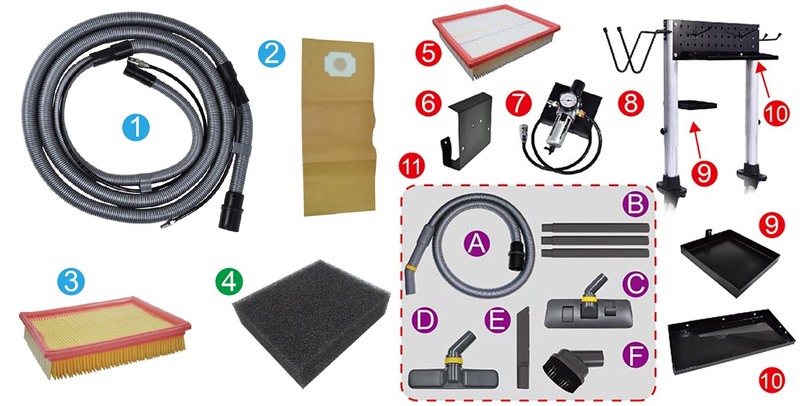 • Auto Filter Cleaning System: Triggering filter cleaning system automatically when sensor detected the low suction, to Improve efficiency of dust extractor performance. It also can be triggered filter cleaning system manually at the same time.